I’m starting to get sort of anxious about the fact that everything I’ve been writing about lately is either brown or white or both. We really do eat other colors of food, I promise. I made pork-fried rice on Tuesday, and I think it ended up having more vegetables in it than pork or rice, but there wasn’t exactly a recipe associated with that meal, just me chopping stuff and dumping it all in the wok. I’m afraid today’s post is just more of the same brown and white, but gosh darn it, meatloaf just sounded really good, and I can’t even remember the last time I made it. 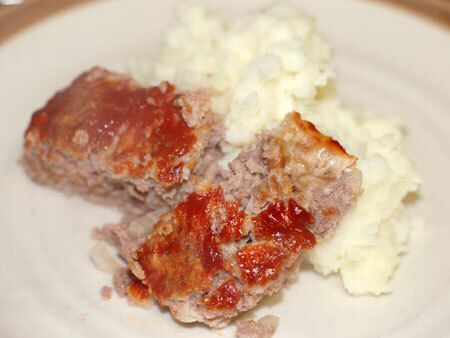 Actually, I think I partially made it this week in backlash against what I thought was a pretty horrifying recipe for bacon-cheeseburger meatloaf that I watched Paula Deen make recently. To me it felt like one of those trainwrecks you can’t take your eyes off of, but then I saw the Food Network’s Top 100 Recipes list for 2007, and it’s right up there at #7. Go figure. Meatloaf is one of those things I would never order in a restaurant or experiment with in the kitchen because the texture and seasonings have to be just so—meaning, exactly like the one my mom made when I was growing up. Jeremy seems to like it too (though he thinks the cooked loaf looks like braiiiiins), and leftovers make great meatloaf sandwiches (we pan-fry the slices to reheat and crisp them first). Preheat oven to 350F. Moisten crumbled bread with the milk, then quickly mix together all ingredients with your hands until homogenous. 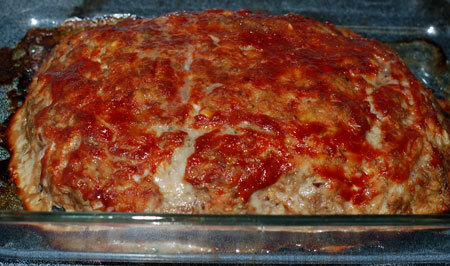 For tender meatloaf, do not overwork. Shape into a loaf in a shallow baking pan, and spread a thin layer of ketchup over the top, if desired. Bake for 1 hour or until done.